I thought I’d better set the scene for you. Of course a half a can of Guinness should never go to waste so I gave it a good home while I baked. I found this recipe on twitter, as it had featured recently in a magazine (Stylist to be specific). I saw it and knew I must have it. Even though I’d just been complaining to AT about my weight and even after we’d promised each other that I would not bake this week – I just knew I would not be able to end this day without making and eating this cake. So I made a quick trip to the store to pick up the ingredients I didn’t have. I couldn’t get my hands on buttermilk so I figured the sour cream in the fridge would probably make a decent substitution (it did). The method was unusual but easy to manage at 7pm on a Tuesday night. Melt this, stir that. But I realised I had masses of batter so I had to make 2 cakes. So I would happily halve the mixture if you don’t want tonnes of chocolate cake lying around. That was kind of a dumb thing to say wasn’t it? 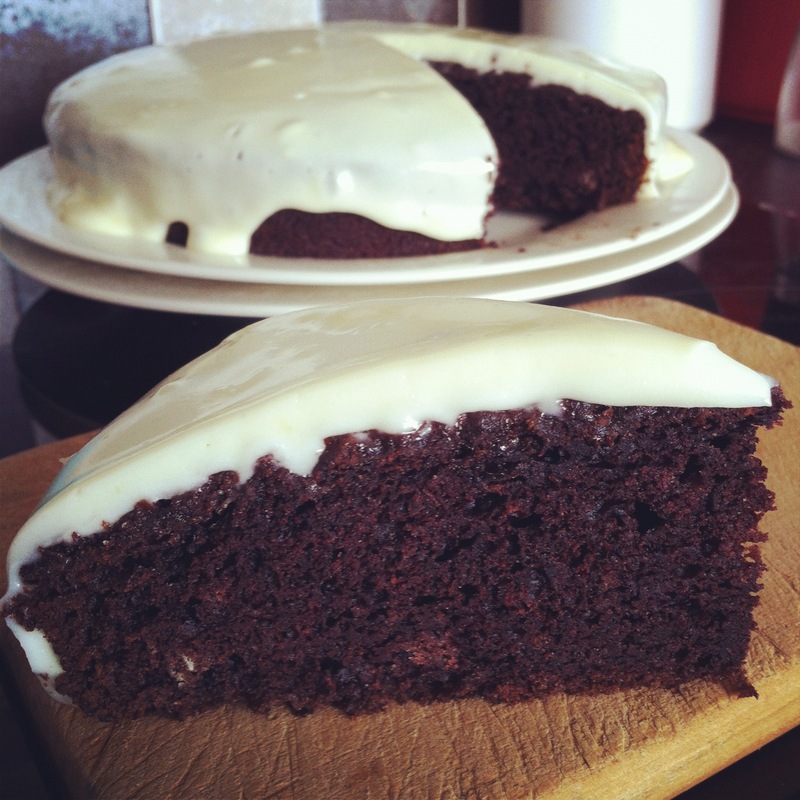 Who doesn’t want tonnes of chocolate cake lying around? Particularly this one. It’s a doozy. It’s one of the best cakes I’ve ever made. Truly. I’m a bit of a terrible cake maker to be quite honest. They’re never really as light and springy as they should be. It smelt strange cooking in the oven but my word, this is a glorious cake. Hot out of the oven it eats like a chocolate pudding without the sauce. It doesn’t need icing at all, in fact I thought the icing was redundant. But, a day later the flavours had deepened and dare I say the bitterness of the Guinness had become a little more evident, but in a very good way. The cream cheese icing combats any tendency this cake might have of being challenging. AT couldn’t decide if he liked the Guinness involvement in this cake, but he certainly couldn’t stop eating it. It is moreish. To say the least. It is like a grown up chocolate cake. A chocolate cake for a dinner party or a lady’s afternoon tea or even better a chocolate cake to eat at 9pm when you’ve had a long day at work and you just want something sweet. That kind of cake. It’s not simple and it’s not boring. It is, in my opinion, one of the nicest cakes I’ve ever had and certainly worth the calories. I realised before posting this recipe, that indeed it has been done before by Nigella Lawson and various other high profile names. The version I shall post is the one I made, that Stylist magazine credits to Tarek Malouf of the Hummingbird Bakery. 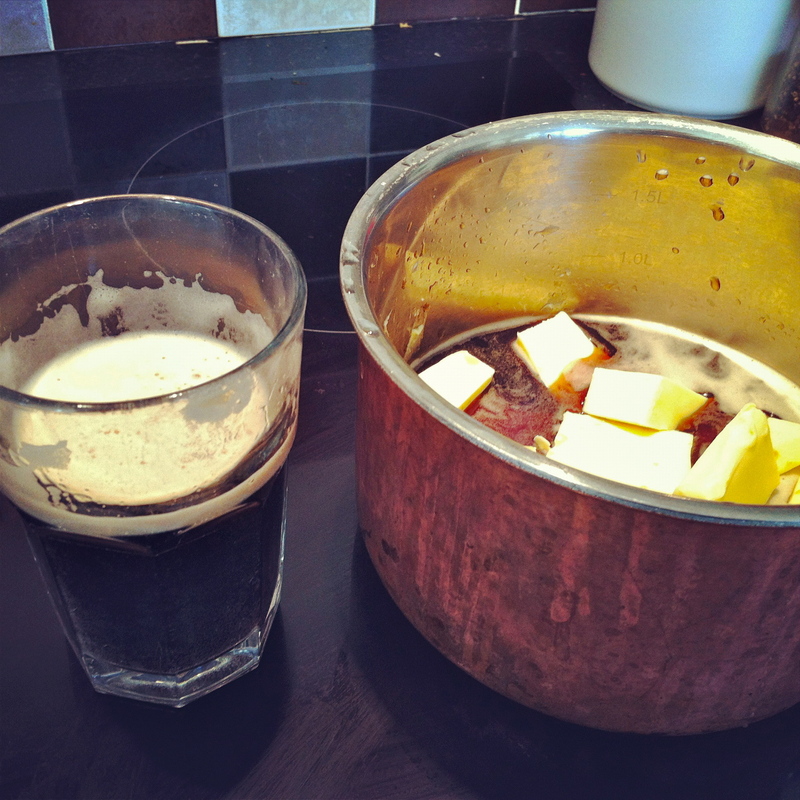 Melt the butter into the Guinness on low heat. Add combined eggs, buttermilk and vanilla. Add combined dry ingredients. Stir till just combined. Pour into cake tin (or two if you’ve only got small tins). Ice with cream cheese mixture. (chuck it all in the mixer and beat till smooth).